"Look, he is coming with the clouds, and every eye will see him, even those who pierced him; and all the peoples of the earth will mourn because of him. So shall it be! Amen" (Revelation 1:7). The nails are an ever-present reminder of the suffering Christ bore for us. It shows His abiding love so that we can live with Him forevermore. Thank You, Lord Jesus! Words cannot measure the depth of your sacrifice! Nail Design Cross Pendant in .925 Sterling Silver. Pendant measures 1 1/16" tall x 11/16" wide (26mm x 18mm). 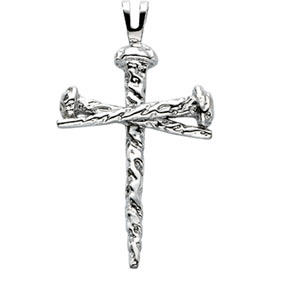 We guarantee our Nail Design Cross Pendant in Sterling Silver to be high quality, authentic jewelry, as described above.